The Bush Schools project saw Brookman Primary School students working with Nyungar Elder Leonard Thor for weekly classes on a riverbank. The classes were designed to teach Year One classes about nature, Aboriginal culture and the important links between them. 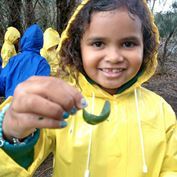 The program takes Year One children out of the classroom and into nearby bushland once a week. They engaged with local Nyungar Elders, who told them stories, taught songs, hunting and gathering, and helped students to explore and understand the bush country they live in. The combination of outdoor environments and relevant indigenous education has paid off, with the Murdoch University-run initiative winning the Community Award for Children’s Week WA. The Bush Schools idea was built by research from Murdoch on the previous success of forest schools in Europe and the UK. A study was conducted over the first few weeks of the course starting in April this year to measure the effect of the program on the students’ cultural identity. “The response from the children, parents and teachers involved in the program has been so positive and we are looking forward to seeing how this translates into learning outcomes in the classroom,” she said. Buoyed by its success, the team is now looking to extend the Bush Schools program to several sites in the Kimberley region.